The words “coral reefs” conjure up images of a tropical paradise: shallow, warm, aquamarine waters, bright sunlight, white coral sand, and colorful, darting fish. But corals also live deep in the sea, in regions where the sun doesn’t penetrate and water temperatures remain just above freezing. 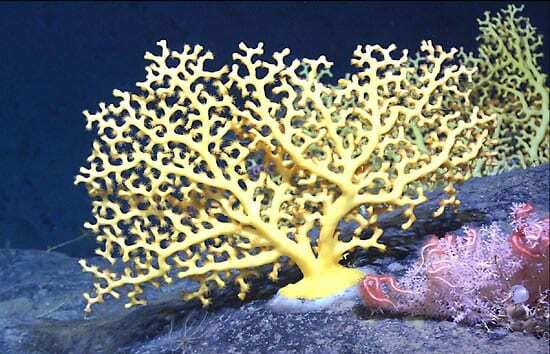 Until recently, deep-sea corals were relatively unknown. But as scientists have explored further and farther, they have found corals living in deep places throughout the world’s oceans. Like their tropical cousins, deep-sea corals can be brightly colored and harbor a rich diversity of underwater life, including abundant commercially valuable fish. 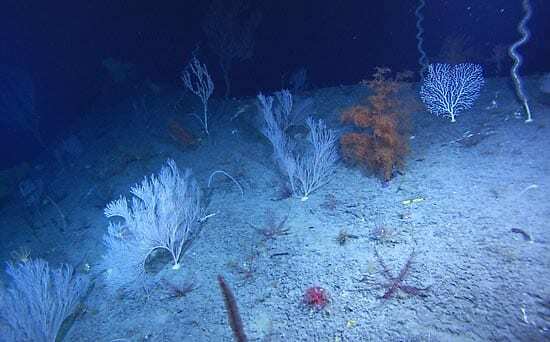 Fishermen have discovered these deep-sea coral communities, too. Unfortunately, commercial trawling on seamounts has caused declines in the fish populations and serious damage to coral communities. Like ancient, solitary, old-growth forests on land, these deep-sea coral communities may be easily disrupted and slow to recover. Once lost, they may disappear, along with the diverse, complex ecosystems they have sustained over long reaches of time. Scientists have learned that deep-sea corals tend to live in areas with rocky topography: on oceanic mountain ranges, the continental slope, and underwater volcanoes, or seamounts, whose slopes and canyon walls provide the two things corals need most: a hard surface to anchor to and access to food. Corals cannot live on muddy or sandy bottoms. They must find something hard to attach to, such as rock or another coral skeleton. Topographic features in the deep sea create islands of habitat, surrounded by fine sediments that are inhospitable for corals. Though corals may look like plants, they actually are colonies of animals, related to sea anemones. Each individual, or “polyp,” is connected by tissue to others, and they live together, usually within a skeleton that they secrete for support. Deep corals differ from shallow-living, reef-building corals in several ways. They live in high and mid-latitudes, not just in the tropics. They need no sunlight, because they do not rely on the symbiotic relationship with photosynthetic algae, which provide food to shallow-living corals in exchange for a place to live. Instead, deep corals feed entirely on small plankton and organic particles—stirred up and brought to them by ocean currents that intensify when they hit undersea mountains. These currents also feed a rich variety of other organisms, including small animals that seek refuge from predators in the large, immobile corals, whose structures are as complex as the trunks and branches of a forest. Invertebrates such as brittle stars, sea stars, and feathery crinoids live directly on the coral colonies, and smaller animals burrow into the skeletons. In the North Pacific, deep coral communities are inhabited by an abundance of fish, crabs, and other commercially important species. 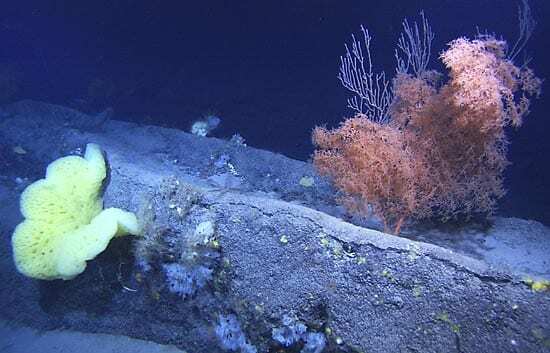 Dense schools of fish are associated with deep coral mounds off Norway and with a kind of coral called octocorals on seamounts off New Zealand. All in all, the corals live in a quiet, stable neighborhood. In deep waters, temperatures and salinity levels are constant. In the depths, the communities are not exposed to hurricanes or buried by a falling rain of sediments, and natural disturbances are uncommon. 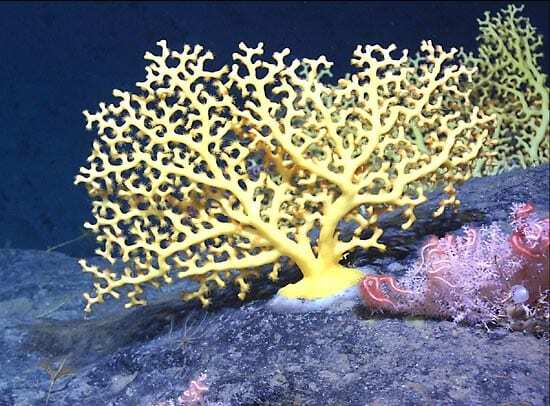 Though they may be found in the same habitats, three very different types of corals live in the deep sea. Stony corals’ skeletons are dense and rocky, often persisting long after coral colonies have died. The stony corals are related to shallow tropical reef-building species (scleractinians). They can form extensive mounds, reaching 12 kilometers in length and protruding as far as 30 meters above the seafloor. Soft corals (or octocorals) often look like colorful undersea gardens of pink, red, and white. They grow in many different forms, including branching sea fans and sea pens. From a distance they look like bushes or trees, sometimes reaching 2 meters tall. An octocoral’s flexible skeleton is formed by small spines (spicules) embedded in a firm organic substance. The third type, black corals (antipatharians) are usually orange to tan in color, but secrete a hard black proteinaceous skeleton. They have varied growth forms, including branching and unbranched shapes. 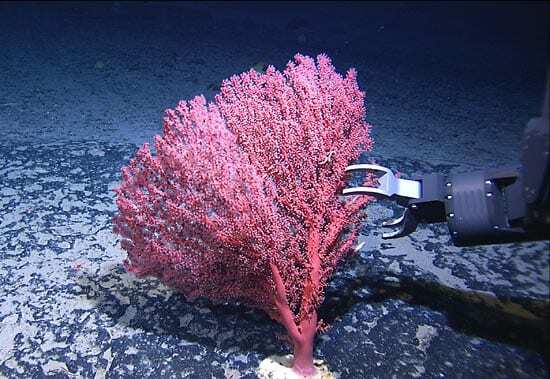 Scientists who have studied deep-sea coral species suggest that they can live for hundreds of years. 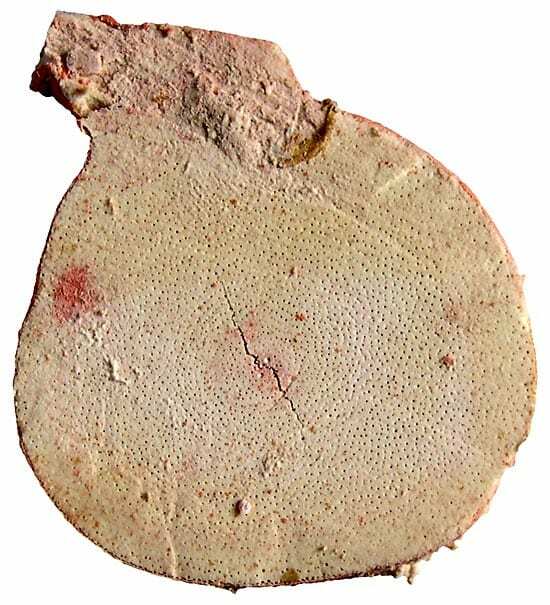 By measuring radioactive isotopes (with known half-lives) in their skeletons, scientists have calculated that some large colonies of the soft corals Paragorgia and Primnoa appear to be at least 500 years old. Reefs of stony corals Lophelia and Oculina are estimated to be more than 1,000 years old. Radiometric dating also indicates that the corals grow very slowly. We still have very little information about how deep-sea coral species reproduce, but we assume that it is similar to shallow species. Shallow-water corals reproduce sexually, or asexually, and some do both. Asexual reproduction occurs through the production of buds that grow on the colony, or by fragments that break off and settle near the parent colony. In fact, some researchers think that even very large mounds of stony coral (Lophelia) are formed by fragmentation, and that individual colonies are genetic clones of the first coral larvae that settled there. Sexual reproduction produces microscopic larvae that disperse through the water—sometimes traveling far before they attach to a hard surface and grow. 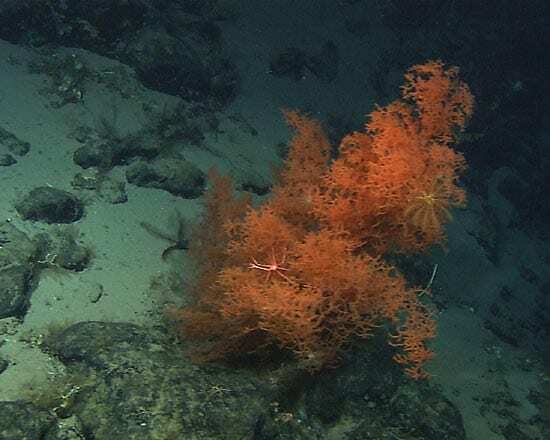 So far, scientists have rarely observed any sites with young deep-sea corals, indicating that these organisms do not disperse and colonize frequently or easily. 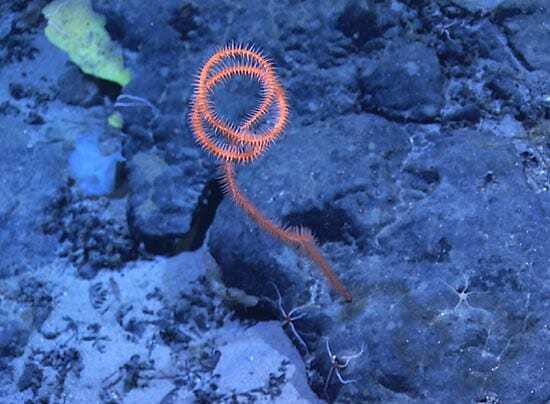 Their slow growth rates, longevity, and infrequent colonization may make deep-sea coral communities more vulnerable to extinctions when they are disturbed. To understand and predict how deep-sea coral communities will respond to and recover from disturbances, we need to know how often and where new colonies are established. Some communities might frequently receive incoming coral larvae from other coral colonies and therefore be resilient to disturbances. Others may be colonized rarely, making them less likely to recover from a disturbance and more vulnerable to extinction. A second critical factor is where new colonists come from. If they arrive as larvae from remote populations, new settlers enhance the chances that a community will recover in the wake of a local catastrophe. But if new colonies form through fragmentation or budding from established colonies, then the source of new colonists expires when the parent colonies are destroyed. We use several methods to investigate how deep-sea coral colonies recruit new settlers. First, we monitor and count coral communities for the appearance of new individuals. Second, we can measure settlement directly. 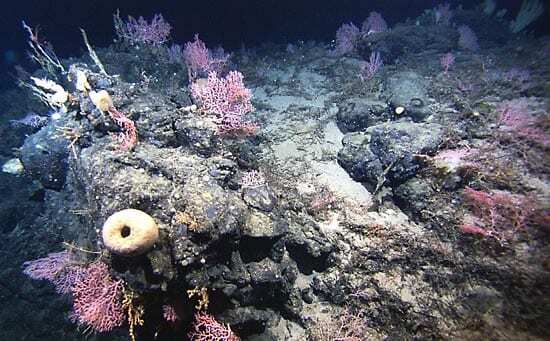 On top of a seamount, we set out clean blocks of basalt, similar to the natural hard surface of the seamount. This provides new, uncolonized habitat for any corals to settle on. After a time, we recover the blocks and count the number of polyps that settled on them. Some new corals appear to prefer to settle directly onto dead coral skeletons. To test this, we can also make experimental settlement surfaces out of biologically produced (biogenic) calcium carbonate that mimics coral skeletons. In our first short-term colonization studies on Pacific seamounts, few larvae settled on our blocks. 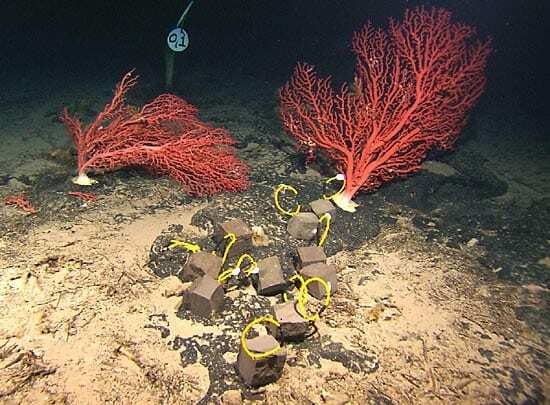 In a longer-term study on the New England Seamounts in the North Atlantic Ocean, we placed 20 blocks at two sites and recovered them after 10 months. No corals had settled in that time, though other invertebrates (anemones and snails) had. Because of the slow settling, we will leave the remaining blocks in place for an even longer time, and we will also place blocks in different habitats at geographically separate sites. To gain insights into when colonies formed, we determine the ages of corals and map their locations within the communities. For instance, if we see a continuous range of ages in a community, including very young colonies, we can infer that colonization is still occurring, and at a fairly constant rate. If instead we see only very old individuals, we infer that a past colonization event established the community, but that new recruits are no longer arriving. We also map the positions of corals in a community to determine the sequence in which the community was settled. If corals are reproducing by fragmentation, we expect the youngest colonies to be located near older colonies. But if colonists arrive as larvae from remote populations, we might not expect to see clusters of the same species. For community-scale mapping, we examine images taken from cameras on the submersible Alvin. But to survey larger areas, we need vehicles with greater range and versatility. To search for new coral communities, a towed camera system is relatively inexpensive to operate and can be used from a ship during night hours when a human-occupied submersible is recharging batteries. Autonomous and remotely operated underwater vehicles are also important tools, providing high-resolution topographic maps and seafloor images. We are also using molecular genetic techniques to investigate where new corals come from, working with Scott France of the College of Charleston. By comparing the genetic composition of newly settled corals to those of established colonies, we can decipher whether more recent colonists come from a nearby or faraway source. If the new colonies started from fragments or budding of locally established adults, they will be genetically identical to them. In contrast, corals from remote populations will have a different genetic makeup. If the new coral differs genetically from older colonies, and we know the genetic composition of other populations, then we may eventually be able to identify exactly where the new coral dispersed from. Deep-sea corals’ impressive ages, slow and infrequent replacement, and role as habitat for diverse communities invites comparison with old-growth forests. However, they are quite different from terrestrial systems, and succession, change, and restoration in these communities may not follow any pattern we see on land. Only by carefully measuring the scale, speed, and sources of new recruits to deep coral communities will we be able to predict how, and whether, they can recover from the kinds of damage they now face. 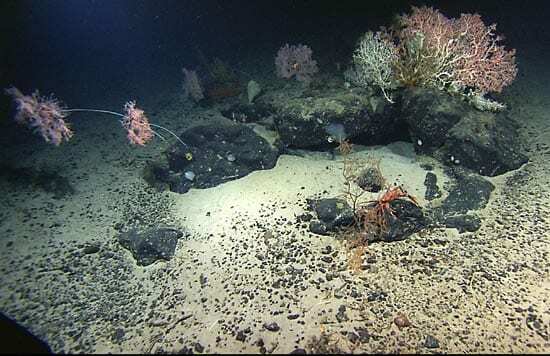 FRAGILE OASES—Rising abruptly from the seafloor, seamounts are home to fragile ecosystems often dominated by corals. They are vulnerable to damage by fishing gear and are believed to be slow to recover. Many scientists recommend making them protected areas. 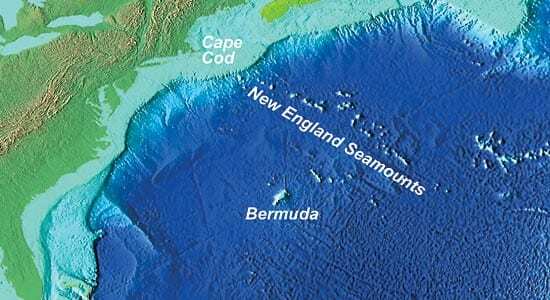 The New England Seamount chain stretches from the coast toward the middle of the North Atlantic. CALCULATING CORAL AGES—By measuring the amount of a naturally occurring lead isotope (with a known half-life) in this section of a Paragorgia trunk, scientists can determine how old the coral it is.